Many of Metro's commuter routes out of North Base have the operators park their coach at Atlantic Base mid-day to save on fuel costs. 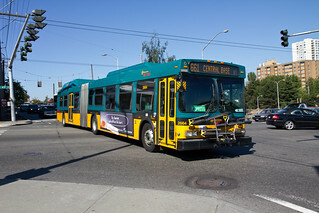 The operators then board this shuttle--northbound in the morning and southbound in the evening--so that they themselves don't have to drive all the way to downtown Seattle. The operators are paid to ride this coach returning to base. Those who report to one of the Central Campus bases (Central, Ryerson, Atlantic) do not get paid for their return trip to the base if walking and/or riding regular service.